Chase Elliott drives around PIR during practice (Sean Gardner/Getty Images North America). 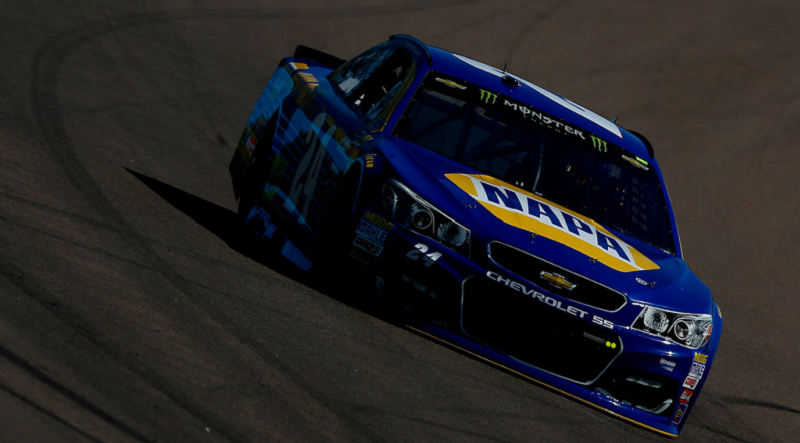 AVONDALE, Ariz. — Monster Energy NASCAR Cup Series sophomore driver Chase Elliott was quickest during Saturday’s morning practice after posting the fastest speed in Friday’s lone session at Phoenix. The driver of the No. 24 Hendrick Motorsports Chevrolet put up the fast lap of 26.475 seconds (135.977 mph) and maintained the top spot throughout the 55-minute session. Pole-sitter Joey Logano was second (135.466 mph) followed by Kyle Larson (135.323 mph), last week’s winner Martin Truex Jr. (135.206 mph) and Brad Keselowski (135.171 mph) completing the top-five. Eight-time Phoenix winner Kevin Harvick (135.089 mph) was sixth quick followed by Dale Earnhardt Jr. (134.988 mph) in seventh., Kasey Kahne (134.902 mph), Ryan Blaney (134.887 mph) and Kyle Busch (134.852 mph) rounded out the top-109. The practice was slowed once for debris as Cup drivers will return on-track for one more practice session at 2:30 p.m. ET, 11:30 a.m. PT and can be seen live on FOX Sports 2.